Indulge in a romantic Fallsview dinner at Windows by Jamie Kennedy Fresh Grill & Wine Bar, The Rainbow Room by Massimo Capra, or the Fallsview Buffet Restaurant. All of these dining destinations offer fresh and innovative culinary creations, extensive wine lists, and remarkable views of the thundering Niagara Falls. They each offer a perfect setting for an intimate dinner in the city and will give you a taste of some of the very best cuisine that the Niagara Region has to offer. The Christienne Fallsview Spa inside the Sheraton on the Falls hotel offers a number of special couples spa packages including the Christienne’s Couple Retreat, which begins with side-by-side massages in the tranquil couple’s suite and includes a relaxing soak in the infinity hydrotherapy bath, which is situated to offer a stunning view overlooking Niagara Falls. Other couples spa experiences include the Ultimate Indulgence, Simply Us, and Just the Two of Us packages which offer varying treatments and services like facials, pedicures, and massages. 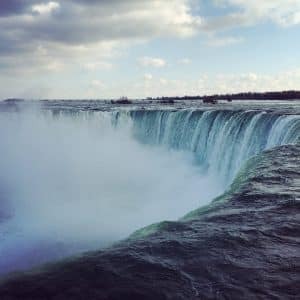 Any romantic weekend getaway to Niagara should include an exciting night out on the town, and there’s no shortage of entertainment destinations to choose from. Stop by Casino Niagara or Fallsview Casino Resort to play some thrilling table games and slot machines, and then catch a live concert or show at Fallsview Casino Resort’s amazing 1,500 seat theatre. Paying a visit to a local winery is another must-do Niagara experience. The charming town of Niagara-on-the-Lake is only a short drive away from Niagara Falls’ tourist district and it’s a worthwhile day trip. The town is home to numerous award-winning wineries like Peller Estates, Inniskillin, and Trius, and offers a picturesque and charming setting in which to relax and experience some amazing wine and cuisine. At night, make sure to check out the brilliant illumination of Niagara Falls and on Friday evenings at 9pm you can catch a spectacular fireworks show that lights up the sky over the Horseshoe Falls. One of the best places to enjoy the show is from a Fallsview room at the Sheraton on the Falls or Crowne Plaza Niagara Falls-Fallsview hotels, which offer panoramic views from floor-to-ceiling windows. And to make planning your romantic getaway as quick and convenient as possible, Falls Avenue Resort offers an amazing Ultimate Couples Exerpience Package. It includes world-class accommodations at the Sheraton on the Falls or Crowne Plaza Niagara Falls-Fallsview hotels, three Fallsview Dining Gift Cards for Windows by Jamie Kennedy Fresh Grill & Wine Bar, The Rainbow Room by Massimo Capra, and Fallsview Buffet Restaurant, two Winery Tasting Passes to Inniskillin and Jackson-Triggs wineries, a $20 spa credit for Christienne Fallsview Spa, and two cocktails from Hard Rock Cafe or the Sheraton Lobby Bar. Start planning your getaway to Niagara Falls today and come experience the romance and beauty of the world’s honeymoon capital.